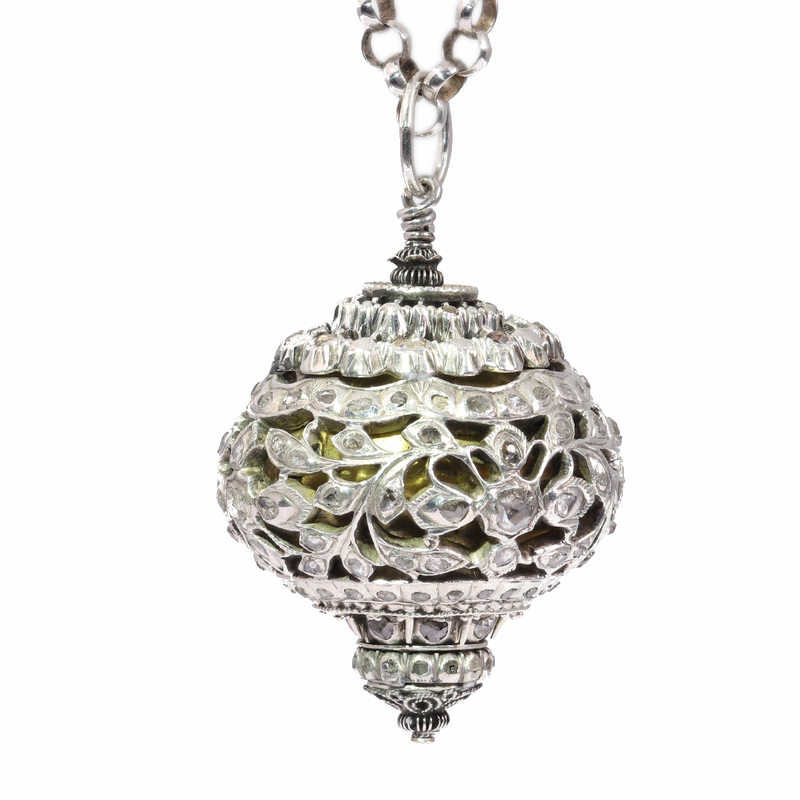 Antique 16th century diamond embellished pomander sphere: Description by Adin Antique Jewelry. Antique jewelry object group: diamond loaded ball as pendant on an antique silver chain to wear pleasant smelling substances. Style: Baroque - Baroque is an artistic style prevalent from the late 16th century to the early 18th century in Europe. It is most often defined as "the dominant style of art in Europe between the Mannerist and Rococo eras, a style characterized by dynamic movement, overt emotion and self-confident rhetoric". Style specifics: Baroque is a style in art and decoration that developed shortly before 1600 and remained current in Europe until the emergence of the Rococo style c.1730. It was started in Italy, and spread to Germany, Austria, the Low Countries, and Spain and Portugal, with only a somewhat severely classical version being popular in France under Louis XIV. The style was a development of the Renaissance style and is characterized by lively, curved, and exuberant forms, by vigorous movement, and by rich ornament, based on classical sources, being symmetrical as distinguished from the asymmetry of the following Rococo style. Extra information (01): A pomander, from French pomme d'ambre, i.e., apple of amber, is a ball made for perfumes, such as ambergris (whence the name), musk, or civet. The pomander was worn or carried in a vase, also known by the same name, as a protection against infection in times of pestilence or merely as a useful article to modify bad smells. The globular cases which contained the pomanders were hung from a neck-chain or belt, or attached to the girdle, and were usually perforated in a variety of openwork techniques, and made of gold or silver. Sometimes they contained several partitions, in each of which was placed a different perfume. The term "pomander" can refer to the scented material itself or to the container that which contains such material. The container could be made of gold or silver and eventually evolved to be shaped like nuts, skulls, hearts, books and ships. Smaller versions were made to be attached by a chain to a finger ring and held in the hand. Even smaller versions served as cape buttons or rosary beads. A pomander can be a bag containing fragrant herbs and might be viewed as an early form of aromatherapy. Pomanders can be considered related to censers, in which aromatics are burned or roasted rather than naturally evaporated. Pomanders were first mentioned in literature in the mid-thirteenth century. They were used in the late Middle Ages through the 17th century. Also a version of the pomander with oranges, cloves, oils, and a golden ribbon can be used as a recovery charm in witchcraft. In the Medieval period pomanders were first made for carrying as religious keepsakes. Extra information (02): Althought the main part of this pomander is typically 17th Century, we recognize some 19th Century alterations to the top and bottom of it. We have opened it and found a brass container in its center that contained remains of a natural sponge. Because of hygienic reasons we replaced it with a fresh natural sponge.